Timber Wolf Axe With Pakkawood Handle | BUDK.com - Knives & Swords At The Lowest Prices! 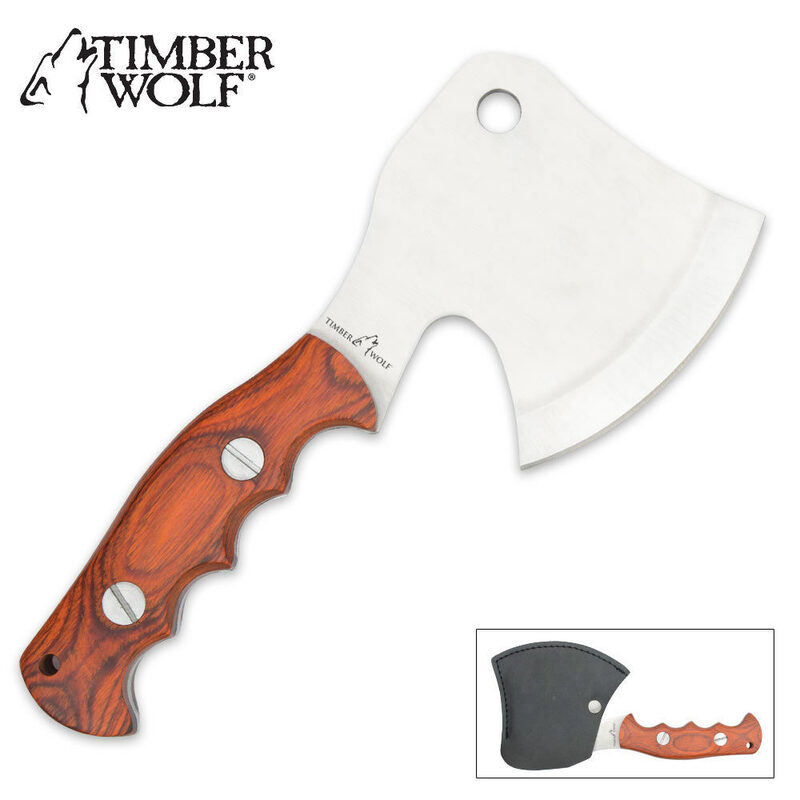 This handsome axe from Timber Wolf is both attractive and functional. With thick, heavy, full-tang construction, this axe is crafted from one solid piece of heavy-duty, solid AUS-6 stainless steel. The blade has been honed to a razor sharp edge, and the genuine pakkawood handle is contoured for a secure, comfortable grip. Measures 9” overall. Includes custom belt sheath. This is a great looking, very well made hatchet. It takes and holds a very sharp (razor sharp) edge. I am using mine as a butcher's cleaver, skinner, Deer and Elk, (any game) processing blade. This is too nice to use for chopping wood. I love this hatchet! First impression out of the box - Beautiful piece! Very solid feel to this little guy! Gorgeous handles that are screwed together nice and tight. It is a solid piece of hardened steel just as it says. Mine came out of the box with almost a razor's edge. It took hair right off of my forearm with a single pass. I don't have any plans on using it as a thrower, although I have little doubt that it would hold up well. I am using it as a skinning tool! point to point. Nice comfortable handle, The weight at the head feels good and gives a solid hit. 1/4 inch tang and along rear of head to about half the head then slow taper to the blade. Definitely more weight in the head. Works well with a mallet for splitting. It's small as one should expect, but it feels like it can do the work around the campsite. Delivery missed my last camping trip by a couple of hours. I just used it briefly in the backyard. My expectations of Timber Wolf grows each time I buy one of their products. Good prices and quality workmanship. I am very pleased with the heavy weight, the strong scales, and the edge holding ability of this hard steel.